It took 16 days for color to creep in. 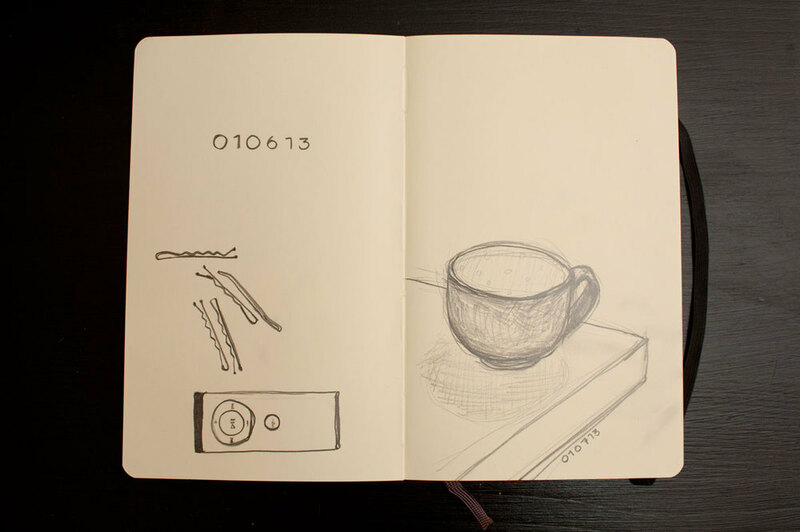 This is a pretty perfect micro portrait of what my days have been filled with as of late - small rituals of taking care. I've been running in the mornings this week, something I've tried to do periodically but always gone back to the evenings because the resistance was too great. That is, it feels like I've been petrified in my sleep, and you try running six miles when your limbs feel like stonehenge. But once the initial suffering has subsided and I'm running through the park, I can feel the morning working its way into my lungs, recalibrating my breath, and it's good. Yesterday and today. I realize I have a small problem of orientation here - the left-hand page was drawn 90 degrees clockwise. I'll have to get a scanner. It's interesting to note how these drawings occur - I bring my sketchbook with me to work, with grand ideas of drawing on the train (ha) or over my lunch break, but I think I'm going to have to work my way up to drawing in public. It's scary enough facing the smug blankness of the page and making marks on it, I'll wait to add the imaginary chorus of judgement until I'm a little more used to it. So instead I've been doing them when I get home, and if I get myopic enough, I'm sure I could fill an entire sketchbook with small vignettes from the inside of my tiny apartment. 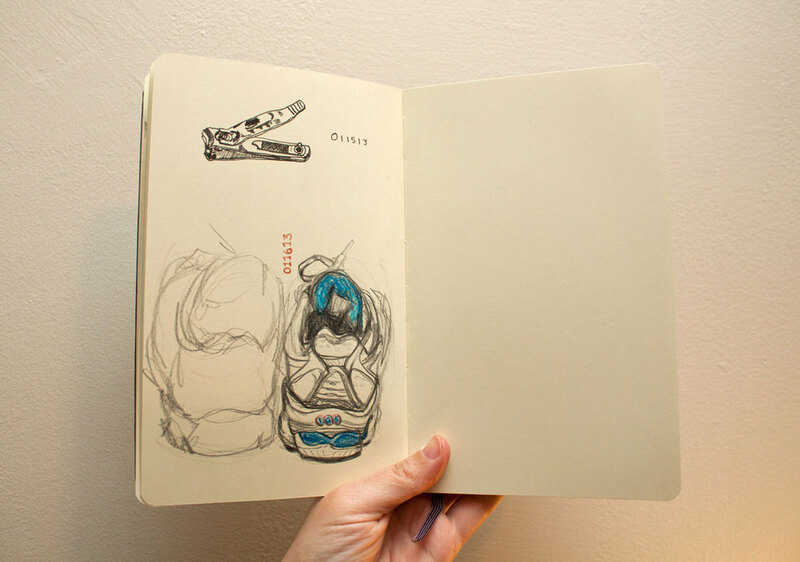 I was riding the G train a while ago, trying to be covert about watching the other people on the train, and I noticed an older man sitting a few seats to my left with a little sketchbook. He was trying to be sneaky about drawing the girl sitting across from me, who had wonderfully buoyant hair. She was reading, so he got away with it. And I thought, that's a neat trick, I could do that. But then, when the train pulled in to the next station, he jumped up, tore off the page, dropped it into the lap of his subject, and ran off the train. She was only mildly startled, because it is the job of the hipster riding the G train to be only mildly emotive at all times. 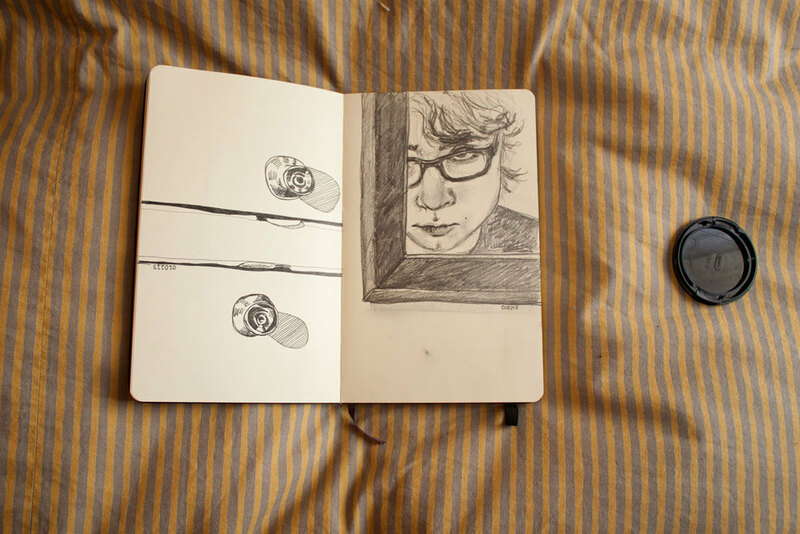 She looked at her train portrait, gave a small smile to where he had been sitting, and tucked it into her book. I caught a glimpse of it as she was turning it over, and I have to say... it wasn't very good. Which makes this drive-by portrait artist even more my hero. One day I aspire to hastily draw a terrible portrait of a fellow rider on the G train, and then disappear, judgement be damned.